And the best day of your life to you! Before we get started today, let me first begin by expressing my very great appreciation to Rich Hoffman for his diligent labors in creating a new website for the Coffee Breaks. As already noted, all 30 of the Multiply.com sites that host these Coffee Breaks (for some 100,000 readers) will vanish as of December 1. Rich is gifted in creating websites and he stepped up to offer his services in creating a new site for us. 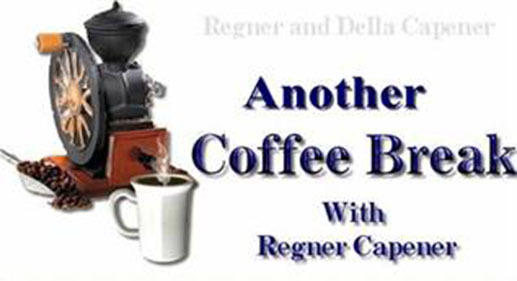 When his labors and efforts are completed, these Coffee Breaks will take on a new identity, and we will change them from Another Coffee Break to Regner's Morning Coffee. All of our archives will move to the new site, along with a fistful of praise and worship music that we have recorded live during the past couple of decades. We will keep you posted as to the shift and timing of the move. That said, let's resume our discussion from Revelation 6, 7 & 8. We've talked briefly about the first five of the seals being opened, along with the four horsemen being released upon the earth; namely, (1) the rider on the white horse going forth with the spirit of antichrist; (2) the rider on the red horse going forth with the kind of death, persecution, and tribulation that comes with a religious spirit (such as seen during the Inquisition); (3) the black horse with its rider causing major weather disturbances and changes, resulting in famine and disease being released in unprecedented proportions; and (4) the pale (green) horse with its rider empowered to rain death and destruction through even more famine (than the rider on the black horse), rare and exotic diseases, wars on every scale, pestilence and animal attacks. I need to insert some commentary here that should have been included in the past Coffee Break. It is important to remember what Jesus said when the disciples asked Him what would be the signs and the indicators of His return and the end of this sinful age. Jesus is making it abundantly clear that the same events He showed to John (in the Revelation) would precede His return. He says of believers in particular, "Then they will deliver you to tribulation, and will kill you, and you will be hated by all nations because of My name." Do you see it? Tribulation is a natural part of our existence as believers -- and in particular, what literally any reasoning individual would refer to as "great tribulation." But Jesus is not coming -- NOT YET anyway! Ever notice that there's no such thing as a "seven-year great tribulation" anywhere in Revelation? That's because tribulation has been ongoing since the first century. This "seven-year tribulation" teaching is a total misapplication of Daniel's prophecy in Daniel 9 -- and I'll probably get to that before I'm done with this discussion. Returning to Jesus' statement from Matthew 24, He makes a critical statement that believers today need to get a hold of: "This Gospel of the Kingdom shall be preached in the whole world as a testimony to all the nations, and then the end (of the age) will come." The "Gospel of the Kingdom" is NOT the message of Salvation, although the message of Salvation must certainly be included. The Gospel of the Kingdom is the message AND the demonstration of the Kingdom of Heaven ruling in the midst of a wicked and perverse generation, along with the signs and wonders that come through and with, accompanying the citizens of the Kingdom -- Sons and Daughters of God who boldly and uncompromisingly show forth every aspect of the Glory of the Lord! It is -- as John clearly demonstrates in Revelation -- the teaching, the preaching, the practice AND the demonstration of all that Jesus is DURING a darkening age with gross darkness falling on people. Jesus goes on to say, "But the one who endures to the end, he will be saved." Endures? Yes Sir! Yes Ma'am! Endures AND overcomes all things! Tribulation. Trial. Testing. Persecution. Temptation. The rebellion of our flesh in the midst of it all. Yesssirrrreeee! Endures and overcomes all things. OK! My inserted commentary got a bit long, but let's continue with our pictures. The opening of the fifth seal made clear that there were many more believers -- and especially those who spoke out prophetically against the sins in the earth being committed by nations and leaders of nations -- to suffer persecution, opposition and death because of the Word of the Lord in them at the hand of those who were rebuked and conscienceless. Yet the promise of the Lord was that He would personally avenge the deaths of all those slain for their testimony. Now we come to the sixth seal. Although the unfolding events will cause men and women to blame the catastrophes on the wrath of God, it is clear that this is nothing more than a colossal wrap-up of "great" tribulation in and upon the earth because of the weight of sin upon creation. Isaiah makes some clarification here as to why these events are taking place when he says, "The earth shall reel to and fro like a drunkard, and it shall be removed like a cottage; and the transgression (Hebrew:pesha': sin, rebellion) thereof shall be heavy upon it; and it shall fall, and not rise again." He thus makes it clear that it is the weight of sin that is causing the earth to reel to and fro, causing the massive earthquakes and upheavals, along with the catastrophic hurricanes and flooding rains ("the windows from on high are open") [e.g., Hurricanes Andrew, Hugo, Katrina, Isaac, just to name a few]. There is a piece of hidden manna in Isaiah's revelation that I personally find extremely exciting, and it comes in the form of Isaiah's statement, "And it shall come to pass in that day, that the LORD shall punish the host of the high ones that are on high, and the kings of the earth upon the earth.” This is a picture of highly successful spiritual warfare being waged on demonic princes (Paul refers to them in the Greek text of Ephesians 6:12 as kosmokrator -- world rulers of darkness) who exercise their influence over certain cities, states, nations, and regions of the world. Isaiah's prophecy is a picture of a portion of Jesus' prayer (we often call it "The Lord's Prayer") where He instructs believers to pray, "Thy Kingdom come, Thy will be done on earth as it is in Heaven." Believers who engage in spiritual warfare through prayer and intercession dethrone wicked princes in heavenly places, and at the same time effect visible change in the governance of cities, states, nations and regions of the world. When intercessors exercise the authority delegated to them by a rhema word from the Lord, and rip out the pinions of the thrones upon which demonic princes exercise power and influence over the affairs of the areas of their responsibility, they bring the Kingdom of Heaven, along with the authority of the Lord Jesus Christ, to bear upon events, circumstances and the governance of those areas. Are you seeing it, folks? This is happening now, as we speak! What an exciting time to be alive! These events are unfolding all around us, and we're on the verge of a massive increase in this activity. Tribulation? Yup! It is, but it is also a gorgeous time of victory for those saints who overcome. I wouldn't trade this time for any other time in all of history! There's a whole lot more to share in these pictures from Isaiah's prophecy, and from John's Revelation, but it really would take us afield from today's discussion so we'll save that for another time. That said, let's take a break from these pictures of tribulation for a bit -- and Revelation 7 does just that. Numerous times throughout the Word we see references to "the four winds" or the four angels who stand at the four corners of the earth. Obviously the concept of "the four corners of the earth" is a metaphor since the earth is a globe without corners per se. Each time throughout the Word where we see a reference to the four winds, it involves either a change of government or a holding back of the government(s) of the earth. I don't have time in this discussion to go there today, and exhaustively demonstrate this, but suffice it to say that John -- in giving us a picture of the angels holding back the four winds -- is communicating a pause in world governmental affairs while the Lord does something extraordinary among the Jewish people. 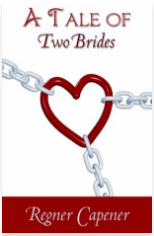 We know that the Bride of Christ is comprised of two parts: the Jews and the Gentiles (or other nations of the world). Metaphorically and pictorially throughout Scripture, we see these two parts of the Bride represented by fig trees (of which the fig, the sycamore and the mulberry are often illustrated) and olive trees. The apostle Paul drew the analogy in Romans 11 of the Gentiles being illustrated as a wild olive tree whose branches were cut off and grafted (contrary to nature) into the cultivated olive tree (representing the Jews) so as to make one new and productive fruitful olive tree. Here's an interesting illustration for you. Remember the 24 Elders who are worshiping before the Throne of God (seen throughout Revelation)? That's two sets of 12. (I'll amplify this a bit more shortly.) Twelve come from Israel and twelve come from among "the children of men." Moving right along with the Revelation John sees (chapter 7) we are told, "And I saw another angel ascending from the east, having the seal of the living God: and he cried with a loud voice to the four angels, to whom it was given to hurt the earth and the sea, Saying, Hurt not the earth, neither the sea, nor the trees, till we have sealed the servants of our God in their foreheads. And I heard the number of them which were sealed: and there were sealed an hundred and forty and four thousand of all the tribes of the children of Israel." Notice the command given the four angels: "Hurt not the earth, neither the sea, nor the trees, till we have sealed the servants of our God in their foreheads." The command is very specific: DON'T HURT THE TREES! What trees? The olive trees! How do we know this, and why do I single out the olive tree? Because of the rest of the command, and the action which follows the command. The angels are sent to gather out and mark (seal) the foreheads of twelve thousand servants of God out of each of the twelve tribes of Israel. Thus, we have 144,000 (the number twelve taken to completion or perfection) gathered from Israel -- a number which represents that portion of the Bride taken from Israel -- who are to be protected and preserved from injury or destruction during the horrific events that are about to unfold. 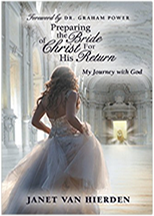 Revelation 14 reveals to us the second half of the Bride as the 144,000 "redeemed from among men, being the firstfruits unto God and the Lamb." We'll get to this group in due time, but that's not part of today's discussion. By the way, we are still NOT at the wrath of God being poured out! We're still in the midst of great tribulation, stress, persecution and opposition. We're still in the middle of events unfolding upon the earth as a result of the weight of sin and rebellion. The singular difference is that for the first time we are seeing the protection, the safety and security of the Bride of Christ taking place so that, no matter what befalls the earth as a result of the unfolding destruction and chaos, the Bride of Christ -- that set apart and holy, glorious people of God -- is protected! Understand, folks, that they are not taken OUT OF, but rather PROTECTED -- SEALED BY THE WORD OF THE LORD -- IN THE MIDST OF tribulation! Consider now the next thing that John sees along with the 144,000 redeemed from Israel: "After this I beheld, and, lo, a great multitude, which no man could number, of all nations, and kindreds, and people, and tongues, stood before the throne, and before the Lamb, clothed with white robes, and palms in their hands; And cried with a loud voice, saying, Salvation to our God which sitteth upon the throne, and unto the Lamb." I'm getting ahead of myself, but before we quit for today, compare that statement to this one from Revelation 14:1-5: "And I looked, and, lo, a Lamb stood on the mount Sion, and with him an hundred forty and four thousand, having his Father’s name written in their foreheads. And I heard a voice from heaven, as the voice of many waters, and as the voice of a great thunder: and I heard the voice of harpers harping with their harps: And they sung as it were a new song before the throne, and before the four beasts, and the elders: and no man could learn that song but the hundred and forty and four thousand, which were redeemed from the earth. These are they which were not defiled with women; for they are virgins. These are they which follow the Lamb whithersoever he goeth. These were redeemed from among men, being the firstfruits unto God and to the Lamb. And in their mouth was found no guile: for they are without fault before the throne of God." Here we have a second distinct group of 144,000 who are redeemed from among men -- NOT from the 12 tribes of Israel. We'll get into this more in our next Coffee Break, but it confirms the picture of the wild olive being grafted into the cultivated olive. We've got a long ways to go yet in this discussion, so let me point out that John is told by the Angel of the Lord, "These are they which came out of great tribulation, and have washed their robes, and made them white in the blood of the Lamb." The significance of this is that these are the overcomers. They have overcome tribulation, testing, opposition, and persecution. They have overcome the same demonic principalities described in the seven letters. By virtue of their overcoming (and that overcoming is a spiritually disciplined decision and effort) they have "washed their robes" and made themselves ready for the Marriage of the Lamb. OK. Have to stop there. We'll continue this discussion again. "Fresh and exceptional things are about to take place in the Church around the world. It will stretch our faith, but it will uniquely prepare us for an awesome demonstration of God's glory. The Bible foretells that the spirit of this generation will be as it was during the days of Noah. The Scriptures portray Noah as one who found favor in God's sight.